The Ministry of Finance was established in 1873, when an amendment to the Constitution Act (SBC 1873, c. 31) established the position of minister of finance and agriculture. Prior to 1873, the office of the Provincial Secretary administered the financial affairs of the province. In 1879, the Revenue Act was enacted and it was this act that first defined the minister’s responsibilities regarding the management and control of the revenues and expenditures of the province (SBC 1879, c. 29). Since this time, the functions were to supervise, control, administer and direct all matters relating to the financial affairs of the government. In 1899, a further revision to the Revenue Act (SBC 1899, c. 65) established the office of the Treasury Dept., presided over by the minister of finance. Although a separate Dept. of Agriculture was established in 1894, the minister of finance continued to act as both the minister of finance and agriculture until 1916 (SBC 1916, c. 14). In 1929, the Treasury Dept. was renamed the Dept. of Finance with an amendment to the Revenue Act (SBC 1929, c. 53). The department was now responsible for the collection and management of provincial revenues, debt management, and the payment and accounting of public moneys appropriated for the use of the government by the Legislative Assembly. In 1976, the name of the department was changed again to the Ministry of Finance (OIC 3199/76). The governing legislation, the Revenue Act, was revised in 1980 and a new Ministry of Finance Act was enacted (SBC 1980, c. 31). Both acts were repealed in 1981 and replaced by the Financial Administration Act (SBC 1981, c. 15). The ministry was renamed again in 1986 as the Ministry of Finance and Corporate Relations (OIC 1899/86) when the corporate affairs functions were transferred from the disestablished Ministry of Consumer and Corporate Affairs. The ministry was renamed the Ministry of Finance in 2001 (OIC 565/01). The current mandate is to provide financial-sector regulation, revenue collection, and services to the public and private sectors through branches which include Treasury Board, Provincial Treasury, Government Services and Registries, Corporate and Ministry Support Services, Revenue Division, Office of the Comptroller General, Business Partnerships Division, and Crown Corporations Secretariat. Custodial history unknown. Presumed to have been transferred from the Dept. of Agriculture to the Provincial Archives sometime around 1945. The file consists of a report collected by the Dept. of Agriculture in 1915. The report was written by Agricultural Surveyor W.H. 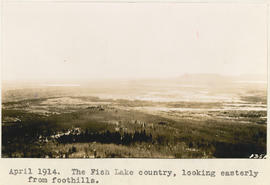 Cartwright and contains information on the physical features, soil conditions and agricultural possibilities of an area just north of the Peace River Block, recorded between April 1913 and October 1914. The report is illustrated with 22 black and white photographs and is accompanied by meteorological readings and some correspondence between Cartwright and the Deputy Minister of Agriculture. Note on front page: Mr. Cartwright made the above survey in company with Mr. G.B. 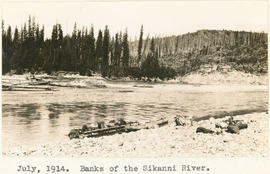 Milligan, B.C.L.S. whose report appears in the report of the Minister of Lands for year 1915.